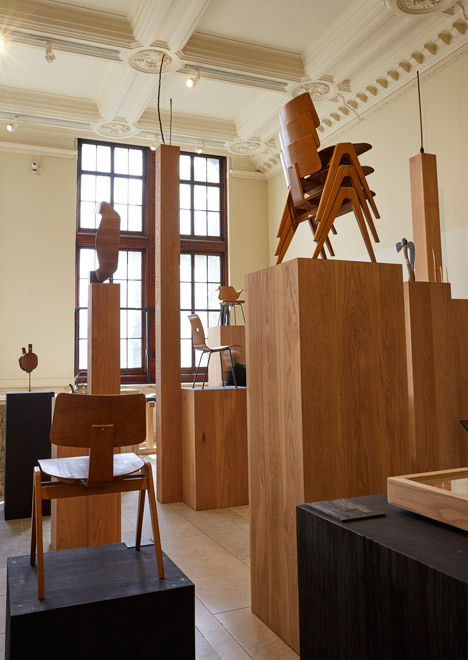 London Design Festival 2015: an exhibition designed by Turner Prize-nominated architecture collective Assemble at the V&A museum celebrates the heritage of late British furniture designer Robin Day. 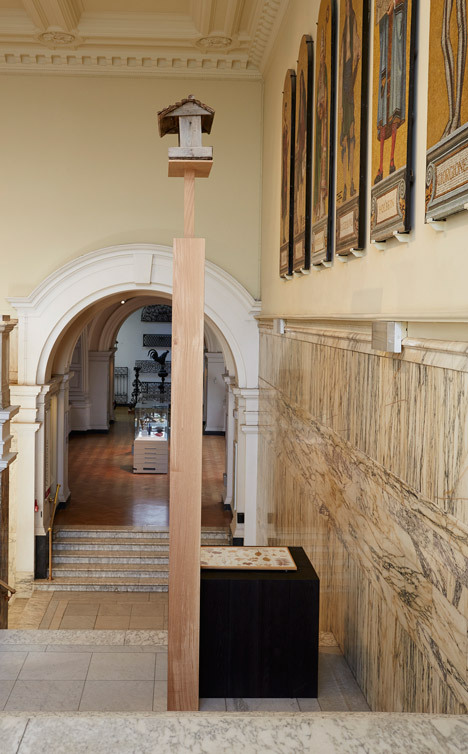 Housed in the V&A's Britain 1500-1900 Galleries space, the Robin Day Works in Wood exhibition presents mass-manufactured wooden objects designed by Day alongside his hand-crafted items such as walking sticks, slingshots and even a birdhouse. "As a designer, I greatly enjoy working in timber," Day said in 2001, nine years before his death at the age of 95. "Unlike synthetic materials, it has unpredictability, an infinite variety of texture and pattern, smells good when worked and is sympathetic to the touch – it has soul!" The exhibition spans the designer's entire career, with a bow that dates back to his childhood shown alongside a slingshot apparently created while in his 60s. Drawings and writings are also on display, many of which have not been shown before. 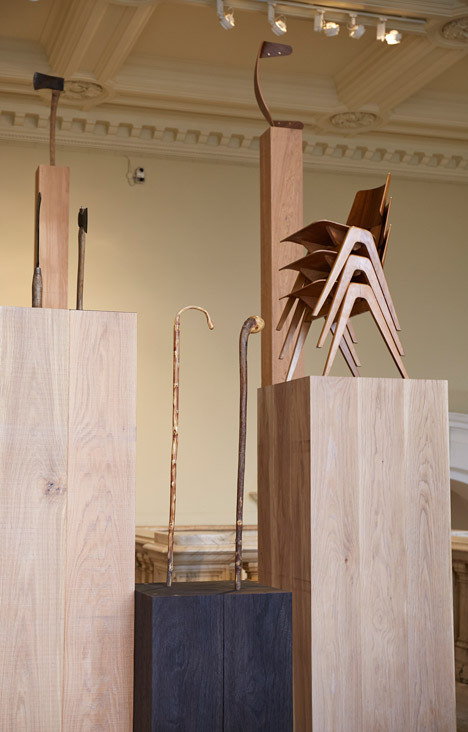 It includes his recognisable pieces like the curved plywood seats designed for London's Royal Festival Hall in 1951, and other chairs made using the same steam-bending technique. Related story: Robin and Lucienne Day's daughter "wasn't prepared to allow their works to be misused"
Exhibition design has been provided by London collective Assemble, which has previously created a climbable Brutalist playground at the Royal Institute of British Architects and is the first design studio shortlisted for the Turner Prize. 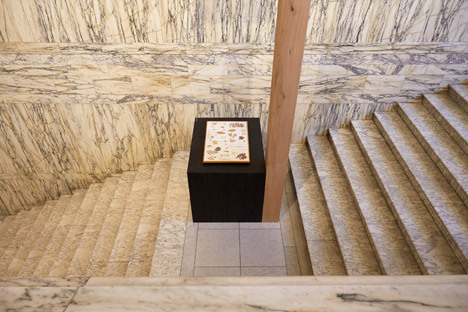 The collective constructed a timber "forest" of columns of varying heights and widths to host each of the pieces. Chairs are stacked on squat wooden plinths, while an axe can be seen placed, somewhat precariously, at the top of a slender column. 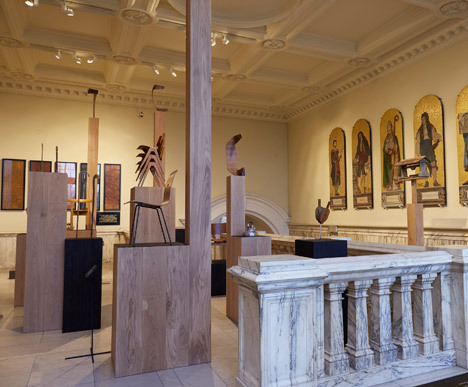 "Wood played a huge part in Day's life, both as a designer and in his home life, but it is an aspect of his work that few people know much about," said the exhibition's curator Jane Withers. 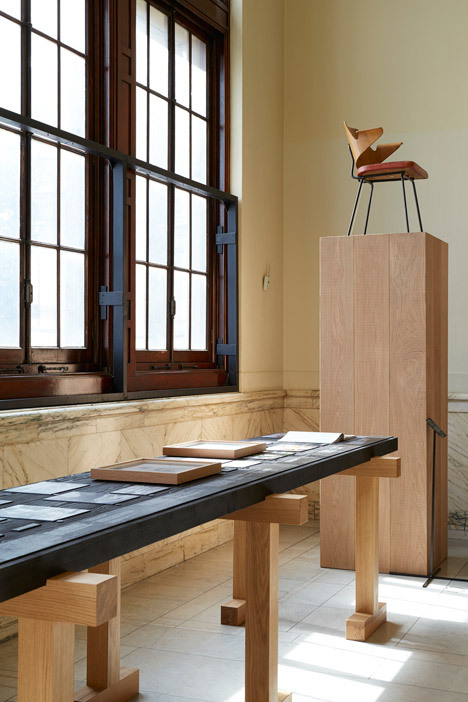 "Exploring this strand through the archives and Day's private woodwork not only highlights how he turned wood into an expressive modern material but also his profound attachment to nature as a source of inspiration as well as raw material, an approach that feels immensely relevant today and is brought to life in Assemble's installation," she added. 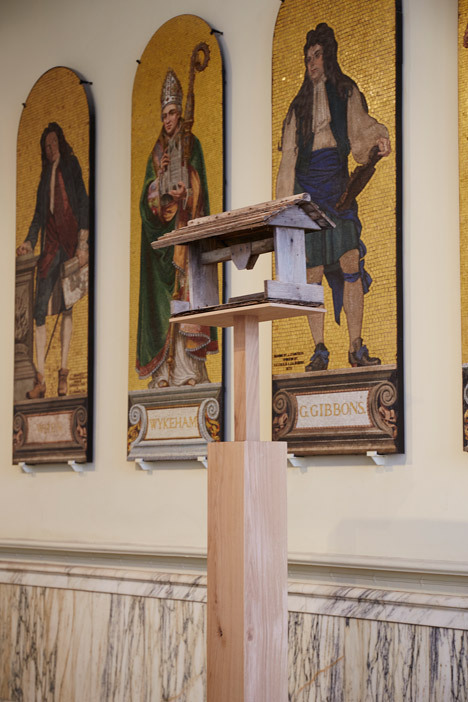 Day's daughter Paula Day, who founded the Robin and Lucienne Day Foundation to continue her parents' legacy, commented on he father's enjoyment of crafting bird tables and nest boxes. "He grew up in High Wycombe making bows and arrows and catapults," she said. "He trained as a cabinetmaker and chairmaker in wood, and for my parents' first home he made the dining chairs by bending plywood with steam from a kettle. All through his career he loved using wood." 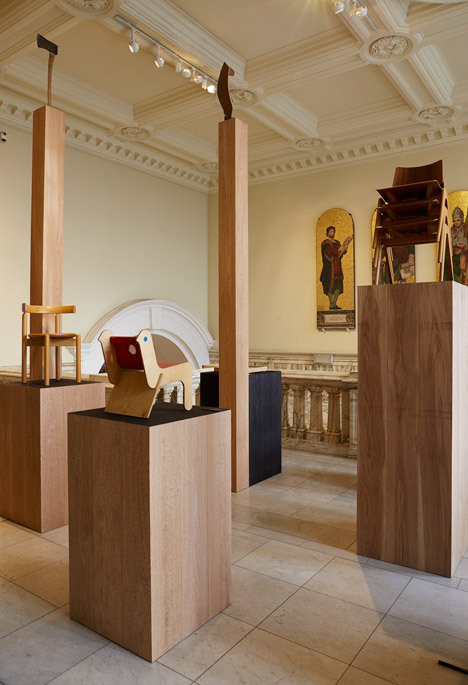 The exhibition is part of the city-wide Day in London design trail celebrating the centenary of the designer's birth. 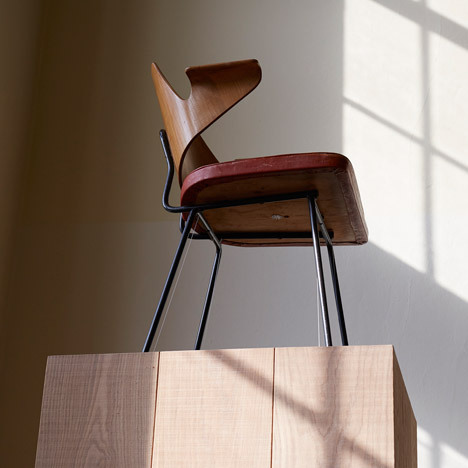 In addition to a retrospective of vintage Day pieces and a seminar on his career, John Lewis is relaunching his 1963 polypropylene chair with an edition that restores the chair's original stacking frame and colours. The trail will also celebrate Day's contribution to London, including his seating for the Royal Festival Hall, the Barbican and London Underground. 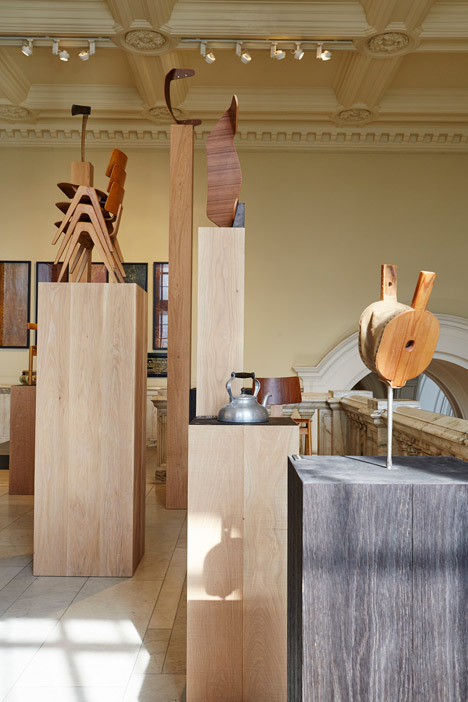 The Works In Wood exhibition, which continues until 4 October 2015, is on display as part of this year's London Design Festival – taking place from 19 to 27 September. Photography is by Paola Pieroni. 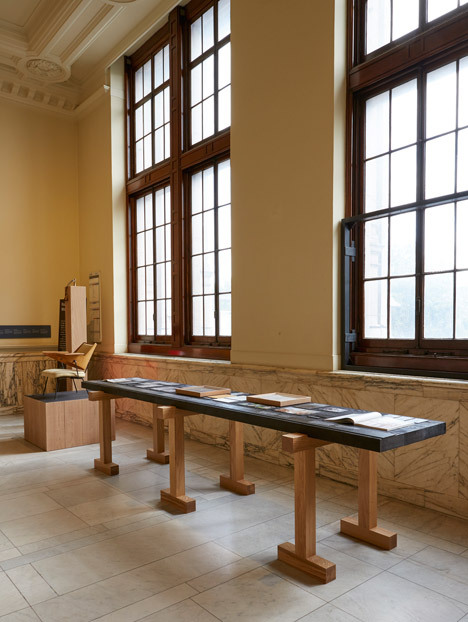 The post Robin Day's Works in Wood displayed on Assemble's "forest" of columns at the V&A appeared first on Dezeen.